A horror film fan who killed his friend in a scene which mirrored one of his favourite films has been jailed for life at Chester Crown Court. Gary George, 42, has been ordered to serve a minimum of 30 years after he tortured and mutilated Andrew Nall, 53, in a "cruel and sadistic" attack. George was obsessed with witchcraft and horror films, the court was told. He initially denied murder but changed his plea to guilty on Wednesday as his three-week trial was coming to a close. On sentencing, the Recorder of Chester, Judge Elgan Edwards, described the murder as a "sadistic" attack. Judge Edwards said he was acting out a scene with "chilling similarity" to one he "particularly" liked in an Australian film called The Loved Ones. George beat his victim and inflicted 49 separate knife wounds. There was also a substance thought to be cleaning fluid found in Mr Nall's eyes, the prosecution said. His body was discovered in his bedroom at his flat in Liverpool Road, Chester, on 30 August. The court heard after the killing George, an alcoholic who was living at a homeless centre in Chester, went into an off-licence where he told the shop assistant: "I've just killed my best mate." George showed no emotion as his sentence was passed. 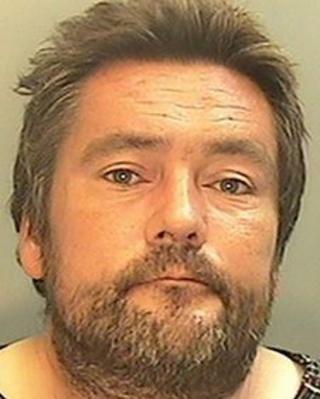 Judge Edwards described Mr Nall, also an alcoholic, as "vulnerable". He added: "He was vulnerable because of the amount of drink he had taken. You knew he had, you took advantage of it and, putting it in a nutshell, he was no match for you." "You killed him in a most cruel and sadistic way and you enjoyed doing so." In a statement Mr Nall's family said the trial had been "harrowing" and their grief was "immense". "Andrew was brutally murdered by a man whom he invited into his home. "The cruel and callous way in which Andrew died leaves us unable to feel anything other than utter contempt for his killer. "He took the life of a kind and caring man attempting to justify his actions by making untrue and wicked allegations that cast aspersions on his victim's character." The family added the length of the sentence imposed "gives us some consolation". Det Sgt Andrew Paine from Cheshire Police said their investigation showed Mr Nall "did nothing to provoke the horrific attacks". He said: "I hope the verdict goes some way towards bringing closure for them."